Here I am with a couple of hours of Somerset Art Weeks to go. I’m fairly pleased with visitor numbers and sales. I have not been idle in the slack times either. It’s been a brilliant opportunity – shut up with an ipad for company – to try out some e-drawing. I went on a course a few weeks ago given by Alison Jacobs, a local artist who is Somerset’s answer to David Hockney, with an awesome mastery of drawing on an ipad. We downloaded several apps and tried out techniques but I didn’t feel I’d really put what we learned into practice. And if you don’t keep using computer stuff you forget. Well, I do! I took a photo of Carson my holiday dog, one of many taken over his Somerset holidays. He writes a dogblog on facebook when he’s staying in Moorlincgh, so I was spoilt for choice. So – a work in progress! Might consider trying a graphic novel (comic ?) one of these years! I’ve really been enjoying using the neocolor II watersoluble crayons – previously they were part of my ‘touching up’ battery of stuff to deploy at the end of a painting when (OK, it happens) things haven’t gone according to plan.But I have some new work for Somerset ArtWeeks ( an alarmingly short time hence) where I chose them from the beginning for their vibrant, lively look, and they seem to work well with more ‘man-made’ shapes. The sailing boats were at a local regatta at Durleigh, while the other two were based on architecture at the stunning Wells Cathedral. The large picture I fancifully call ‘Forest of Stone’ because the tall column and slimmer pillars reminded me of a spreading tree. I suppose that sort of covers my greetings cards subjects these days – I have done the odd Polar Bear and some Highland cattle (not really usually wild, are they). And sheep and ponies – do they count? I have tried to add a new specimen annually as a Christmas card. So this year, having dallied a while with otters I finally settled on badgers and I will have the cards at my Somerset Art Weeks Open Studios 2019 exhibition (number 22). Last Christmas I branched out into coasters, although getting the subjects to form a nice square was challenging! And here’s an otter anyway! Cute – but not Christmassy? 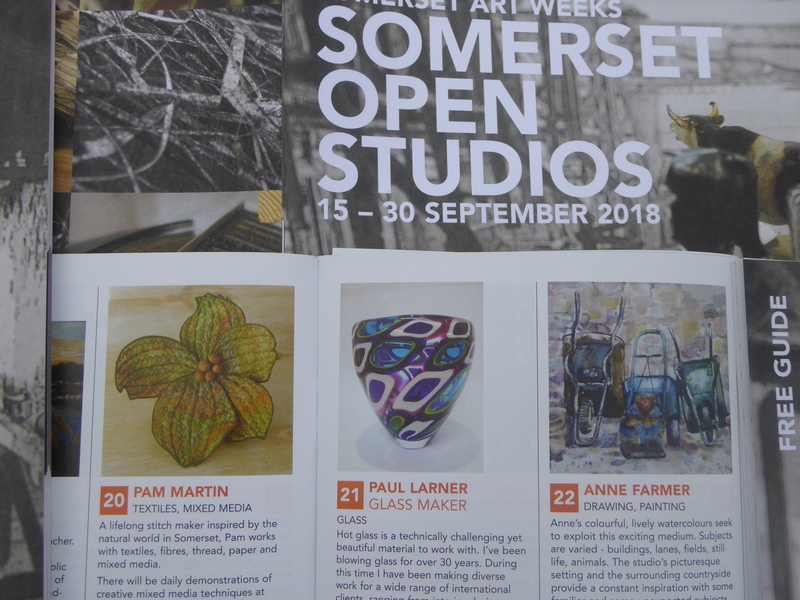 The brochures are out, so it’s Somerset Artweeks time again – Open Studios 2018 are just around the corner! This year, at Spring Farm Arts there are old hands Me and Pam Martin, and, exhibiting at SAW for the first time ever, Paul Larner will be at the Glassworks. …always gives me a problem. I always want to do more than I’ve got the time to do stuff and I’ve always got more stuff than I’ll ever use. So Last month when we were lucky enough to be staying in a Cotswold Cottage with loads of potential drawings on the spot. I tried to develop a simpler and, dare I say it, more disciplined approach. I was armed only with a tiny paintbox , a mediumish kind of brush and a pot of water (not a collection of two dozen tubes of paint and a massive palette), a stick of g.raphite and a stick of Derwent graphitone which is water soluble. Anyway, when I got home I went out on the nature reserve (Shapwick Heath) and had another go. I painted the cattle first, as they were on the move, and by the time the half-hour was up, they were nowhere to be seen! Anyway, an approach worth persisting with, I think. A race against the clock is a great aid to simplification! Then for March there was the gift of the red super blue moon – not sure those adjectives are in the right order – from a quick early morning snapshot. And a few moments snatched outside the hall during one Wednesday morning Art Sessions gave me the rooftops. Yes – the wheelbarrows won! And meanwhile, that’s a start made on the 2019 Calendar. Where did that year go? Christmas is coming – again! November has come and gone – not without artistic activity but it went unrecorded. I’ve been busy having coasters made, featuring some of my paintings. I’m a bit ambivalent about the point of coasters but having sold all my calendars I was looking for another product for our current event: Creative Christmas at Moorlinch. So here we are, mince pies and wine at the ready, open for business! That’s what the last day of Somerset Art Weeks always feels like. We’ve had over 400 visitors on which I’ve deployed my opening gambit ‘Hello, come in, I’m Anne and these are my paintings’ (the latter being marginally more obvious then the former) This is followed by a choice from a short list: 1) Have you come far? 2) Are you doing the rounds? and 3) Do you paint ? I’m probably not alone in preferring the answer to question 3) to be in the negative! The fox as discussed in my previous blog is also going too. My new venture into etchings has been quite successful too – excellent teaching by Jenny Graham to thank for that. My (nearly) last job before Somerset Art Weeks in about 10 days time was to create my 2017 Christmas card. I usually choose and animal image and this time I wanted to have a Fox. We occasionally get a fox visiting the garden and I had a few images from this year when she came leaping over the stream in search of the fallen cherry plums. None of her poses was quite right though, so I had to resort to the internet for a bit of help. I finally decided I wanted to concentrate on quite a close-up view of the head, but not too centrally placed, with room to suggest a snowy setting.